The hot weather has arrived! To celebrate I'll be making lots of iced treats including ice cream, gelatos and sorbets. I had kiwis in the fridge this weekend so I decided to start there. I added some honey, lemon, a touch of rum and the sorbet turned out perfect. Psst...the secret ingredient is lemon verbena. Enjoy! 1. Bring water, sugar and honey to a boil to make simple syrup. Remove from heat, stir until sugar and honey are completely dissolved. Add lemon verbena leaves and then let cool. Remove the lemon verbena from the cooled syrup. 2. Puree the kiwis in a food processor. Add the syrup, zest, lemon juice, rum and blitz for 1 addional minute just to combine. 3. Transfer the kiwi mixture to your ice cream maker and freeze according to manufacturer’s instructions, Let it churn until you get your desired consistency. 4. Transfer the sorbet into a covered container and freeze until you're ready to enjoy it. So refreshing! A delightful sorbet! Wow, this is really a unique and delicious sounding combination. Perfect for the warming weather. Your photo is gorgeous as well. this looks so colorful and nice. Wat an awesome combo for a sorbet, very refreshing.. Refreshing and healthy... this is good!! 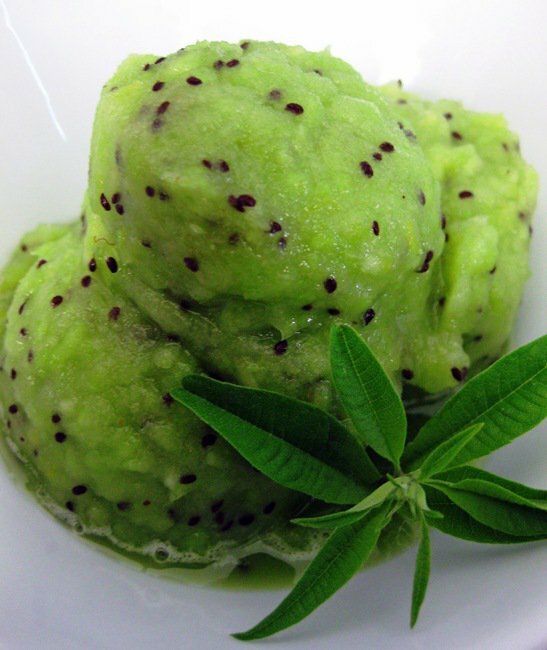 You look at this sorbet, especially with the kiwi seeds and you know exactly what you're getting. Love thy lemon verbena. Wow! I bet this is amazingly refreshing, mmm! I'm always having kiwis...why not make a sorbet out of it. Thanks for a very refreshing recipe. Of course! Love the lemon verbena idea. It's brilliant. As is the color of this sorbet... those seeds make it so very fun. WANT WANT WANT... LOVE IT TOTALLY Dragon girl!! wow! this is truly a treat! love it! Me gusta esta receta, acabo de adquirir una heladora, asi que creo que me tendrás por aquí a menudo, besitos.